Bentley is a name synonymous with performance and quality, from sporting victory to the last word in luxury. The Bentley pen collection captures the heritage and prowess of the Bentley brand. All Bentley writing instruments are produced in limited editions, their aesthetics designed to capture the very essence of Bentley design. Created by Bentley's designers, Bentley pens are manufactured by Tibaldi, Italy's oldest fountain pen manufacturer, to the highest standards using a combination of high-tech manufacturing techniques and traditional artisan craftsmanship. Bentley writing instruments are set to become a favourite with pen collectors and Bentley car enthusiasts alike. Two giants of luxury design combine forces to bring you the “Graf von Faber-Castell for Bentley” collection. The timeless designs, overseen by Chris Cooke, Head of Product Design at Bentley Motors feature peerless precision and world-class craftsmanship. 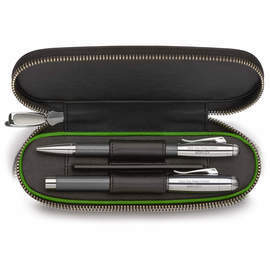 Black Italian calfskin with design points reminiscent of Bentley interiors offer the perfect cases for Graf von Faber-Castell for Bentley pens.